Here is my photo of a brilliant "Iridium flare," a reflection of sunlight from the Iridium 58 satellite, seen from very close to the center line of the reflection. Maximum brightness was magnitude -8, far brighter than Venus ever gets. This is about as bright as any satellite ever gets. 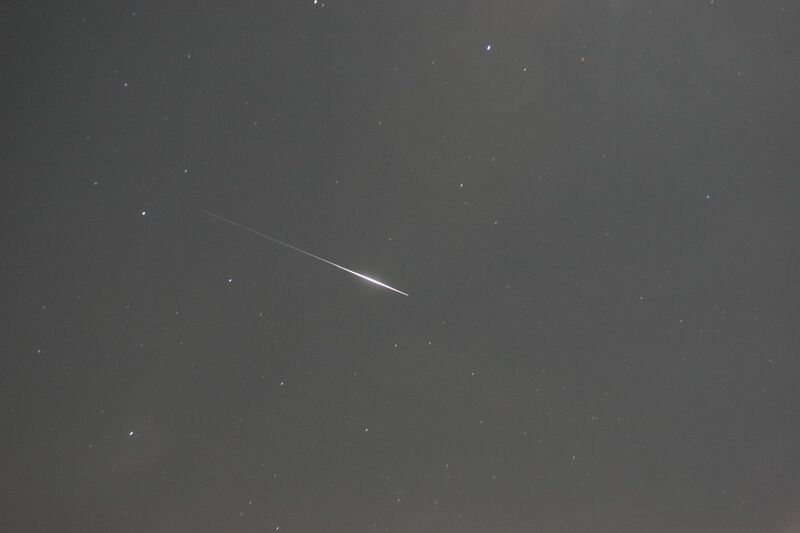 In this photo it looks like a meteor, but it moves much more slowly.The satellite, seen here moving southward through Leo, was recorded during the full 24 second exposure. A meteor would cover that angle in less than a second. The bright star just right of top center is Regulus. Denebola is near the bottom left corner. These Iridium satellites are, I'm sure, the source of many dramatic-sounding UFO reports. Iridium 58 flares to magnitude -8, seen from Lakeside, CA, April 4, 2017. Each Iridium has three mirror-like antennas about the size of a door. Unlike the surfaces of other satellites, which are concave or not very reflective, Iridium antennas are flat, silver-coated Teflon panels. When sunlight hits at a certain angle, an Iridium casts a brilliant reflection up to 30 times brighter than Venus, reaching a patch on Earth of about 20 square miles. When I saw that the center of this small patch of maximum brilliance would be passing only 2 km away, I got my camera ready. And, we are now informed that the days of Iridium flares will soon be coming to an end. The old generation of iridium satellites will be retired, and the new generation will not produce these brilliant flares. 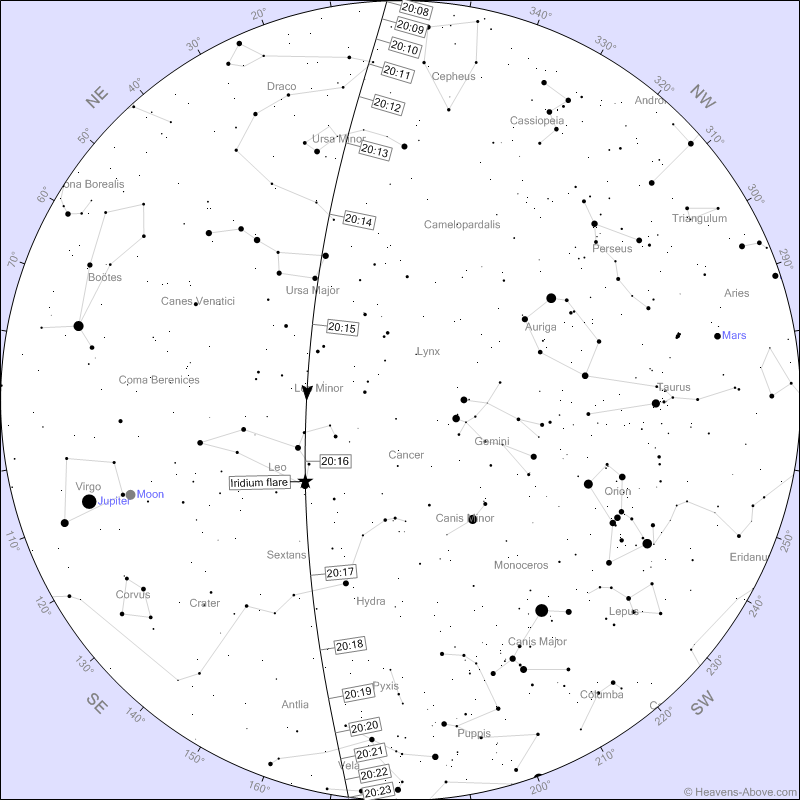 Skywatchers: Get your Iridium flare fix now. Iridium Flares. For the next seven days.Click on each one to get a sky map showing its location. Daily Predictions of brighter satellites. You can choose whether to see only the brighter ones, or the much longer list of faint ones. 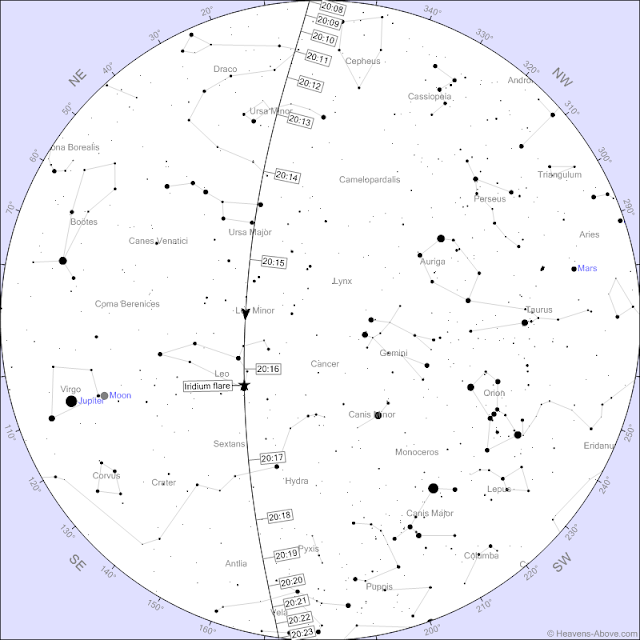 Click on each one to get a sky map showing its path across the sky. Planets positions at any given time. Bright Comets and Asteroids currently visible, with sky maps to locate each one. If you see something in the sky that you can't identify, and you don't even check Heavens-Above.com to compare its position with known objects at that time, then you're not really serious about trying to identify it. One fellow spoke at a UFO meeting I was attending about bright objects he was observing crossing the sky. I said that the next time he sees something he needs to record the exact time of his observation, and the object's path across the sky, then compare that with the satellite data at Heavens-Above.com. He replied that he didn't want to do this, this would somehow spoil the atmosphere of the sighting. I suspect that many people feel like that - why spoil an exciting air of mystery with cold, unfeeling facts? If an object you sight does not appear on this list, that does not mean it's an alien spacecraft. The orbital elements of classified military satellites are, well, classified, and hence those satellites won't appear on this list. The reason is that we don't want hostile actors to know the exact time at which we will be surveying them. There is also a considerable uncertainty in the brightness of satellites. Since there are thousands of objects in orbit, one typically requests to see listings only of the brighter ones. Suppose you generate a list of satellite passes predicted to be magnitude 3 or brighter (smaller numbers are brighter). Suppose one satellite predicted to be magnitude 3 actually shows up at magnitude 5, because of sun angle or some other factor, and hence much more difficult to see in a light-polluted sky. You'll chalk it up as a no-show, but it was there - just faint. If you want to read some observations by some of the world's top satellite observers see the SeeSat mailing list , the world's leading forum for expert discussion of satellite observations and satellite orbits. Some of these investigations involved observations of classified military satellites, about which little is known to the public. Ted Molczan is one of the best-known and most-respected civilian authorities on observing and identifying satellites in earth orbit. 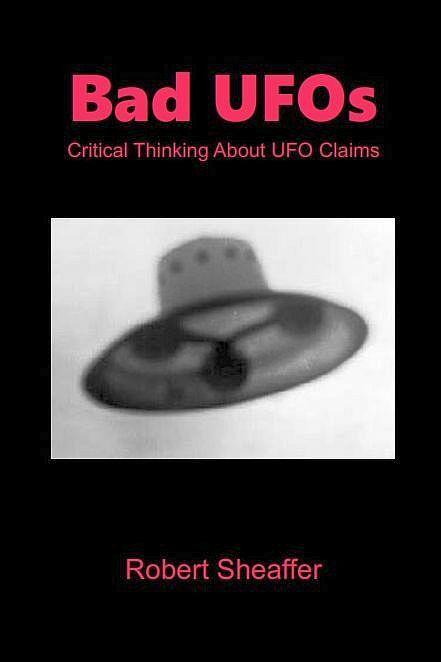 He is a leading contributor to See-Sat L. Molczan showed that the "classic" Yukon UFO of 1996, proclaimed one of the "Top Ten" UFO cases of all time, was in fact the reentry of the Russian rocket booster that placed the Cosmos 2335 satellite into orbit earlier that day. Molczan has compiled what is intended to be a complete list of all satellite and space debris re-entries that have been observed and recorded, and he keeps the list updated. The list is in chronological order. If you are investigating a UFO sighting, this list will enable you to check it against all known observations of space junk falling back to earth.